Standing an 18-story rocket on its tail so it can fly into space requires careful coordination among a team of pros along with an intense focus on safety and quality. The rocket in this case was the ULA Delta IV Heavy that is being prepped to lift NASA’s first Orion spacecraft into orbit during a flight test in December. You can read details about the move and lift that took place Wednesday morning here. Orion is designed for deepspace missions that will fly astronauts to an asteroid and eventually on the journey to Mars. But there are important evaluations to perform first, before the spacecraft carries any people with it. That’s what this uncrewed flight test is for. 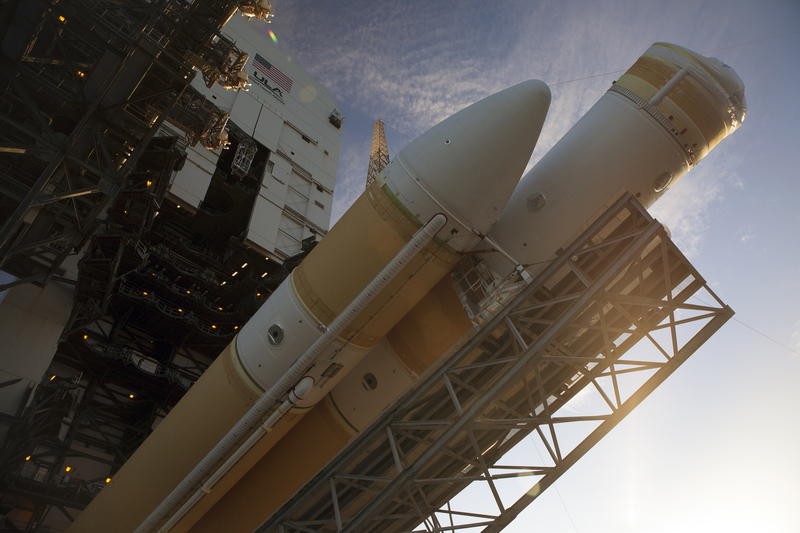 This mission will see the Orion lofted into an orbit 3,600 miles above Earth using the Delta IV Heavy. The spacecraft will be steered back into the atmosphere for reentry at some 20,000 mph to gather data on the heat shield at speeds approaching those it will encounter when returning crews from deep space. Many of Orion’s other critical systems will also be evaluated during the important flight test. Flying to asteroids sounds like something our of a movie. It’s incredible to think that it is a possibility. A new start. Maybe we’ll understand thus the message ancient civilisations sent us. Imagine to have the answer for the question why Teotihuacan or Gizeh are related to Orion. Why did the builders of the pyramids all around the world point to Orion. It’s an amazing story indeed. How do you get Orion to the top of the platform to attach to the Delta IVS ? This is an innovative beginning. They are doing well and should be congratulated once again for their success. This a work that actually involves much time to complete. Really another fantastic success.